Our cabin is in Wawona,,Address: 8063 Chilnualna Falls Road,Wawona,Calif. 95389 a small village located inside Yosemite National Park. The cabin comfortably sleeps six in two bedrooms and a separate closed-off alcove area. There is a modern kitchen, dining area, and a family room that faces a large stone fire place. One bedroom has a king-size bed; the other bedroom has a queen-size bed. The alcove area has a trundle bed with two twin-size beds. The modern kitchen has a gas cook top and oven, large refrigerator, microwave, toaster oven, coffee maker, and abundant cooking and eating utensils. The family room has an L-shaped sofa and rocking chair, free Dish TV and Wi-Fi, ceiling fan, and a large fire place (great during winter). Ample firewood is provided at no charge. The dining room table sits six comfortably and the kitchen bar seats an additional two guests. There are two bathrooms (shower in one, tub and shower in the other). A washer and dryer are also in the cabin and are provided at no extra cost. A large deck surrounds the cabin and provides unobstructed views of Wawona Dome and an adjacent meadow where deer and other wildlife often gather. The deck is furnished with tables and chairs for more than ten people and a propane barbecue. The cabin has forced-air heating to keep you warm during winter nights and a ceiling fan to help cool you during the summer. Parking for five cars in a circular driveway provides easy all-year access off of the paved road. The cabin is within 45 minutes driving time of Yosemite Valley where you can walk in the steps of John Muir as you view Yosemite Falls, Bridalveil Falls, Half Dome, Cathedral Spires, El Capitan, and Mirror Lake. You can also hike to Vernal Falls, Nevada Falls, and Half Dome through Happy Isles and along the Mist Trail. The cabin is also within 50 minutes of Badger Pass Ski Area and Glacier Point. In the winter, Badger Pass offers downhill and cross-country skiing, snowboarding, and snowshoeing. At Glacier Point, you will have a panoramic view of Yosemite Valley, the park's many water falls, and Half Dome. It is also a trail head for the 8-mile spectacular Panorama Trail to the Valley floor along which you will view Vernal Falls and Nevada Falls up close (but not too close). The cabin is also a short drive to the Mariposa Grove of Giant Redwood Trees. Take the tram or hike and enjoy the experience; it is worth it. The village of Wawona is minutes away from the cabin with a country store, post office, gas station, stables, the historic Wawona Hotel, the Yosemite Pioneer History Center, and the beautiful Wawona Golf Course. On Saturday evenings, check to see if there is a barn dance at the Pioneer Yosemite History Center or an outdoor barbeque at the Wawona Hotel. The whole family will enjoy it. From the cabin you are also minutes away from swimming or fishing in the Merced River. A secret spot to enjoy the river is near the flat rock, across the road and down the hill from the Wawona School in the village. You can also take a leisurely hike to the swinging bridge over the south fork of the Merced River or a more challenging hike to the top of Chilnualna Falls. There is even a public library just down the street from the cabin if you want a quiet spot to relax, read, and research your next excursion. Two families have owned and enjoyed this cabin for over 20 years. It has been a cherished spot for many family vacations, retreats, and reunions. The owners have continued to update the cabin with new tile and carpeting, modern appliances, comfortable beds and furniture, and a unique deck that surrounds the cabin and offers wonderful views. The owners treat this cabin like their home because it is, and they want their guests to experience the same joy, wonder, and happiness that Yosemite has provided their families throughout the years. The cabin is actually inside Yosemite National Park, not in an adjoining town or area. It is located next to an open meadow and has a great view of Wawona Dome, which turns golden as the sun sets. The accommodations are modern, convenient, and comfortable. This cabin will enable our guests to enjoy fully a true Yosemite experience in a private home without worrying about trying to secure campground or hotel reservations. This cabin is warm and comfortable. After a day of hiking or golfing in the spring, summer, or fall, you can spend a lovely evening on the large deck, enjoying a barbecue dinner, the incomparable view of the alpenglow that basks Wawona Dome, and the deer that stroll across the adjacent meadow. After a day of skiing or snowshoeing in the winter, you can prepare your favorite drink and snacks as you relax or read in front of a roaring fire. And, in any season, you can watch the free satellite TV or hop on the internet. But don't spend too much time doing this; after all, you are in Yosemite! Beautiful view of meadow and Wawona Dome from living room, kitchen, and large deck. Circular driveway holds 5 average size cars. Fireplace, large L-shaped sofa, rocking chair, large screen TV, cabinets, etc. Modern cook top, oven, refrigerator, microwave, coffee maker, toaster, dishes, glasses, and utensils. Wawona Golf Course within 2 miles. House was very clean and well occupied. Only thing I noticed, shower heater control very slowly picking up so difficult to adjust water temperature. The house is located near the falls and river trails. The fireplace is huge, the deck is spacious. The house is very quiet. There is no dishwasher and the showers are a bit old. Overhall a great place to stay! This cabin was clean, comfortable for 6 (if two don’t mind a trundle bed) and fairly well stocked. (We purchased a better scrubbing sponge and more garbage bags. Diane was perfectly willing to supply these but as we were at the store...) The cabin is a bit dark for those who enjoy reading at night. Though I’d definitely recommend it and stay there again. Nice, clean, comfortable place. Good deck space. With beautiful view. Great location. Screens on all 4 doorways would be nice for cross breezes and trundle mattresses could use updating but did not pose any sleep issues.There were 5 of us, we all enjoyed this rental very much!! We loved everything about this adorable and comfortable cabin. BBQed every evening on the deck, ate both inside and outside. Two bathrooms perfect for two couples and beds very comfortable. Did not mind the distance to Yosemite Valley as there are plenty of things to do nearby, such as swimming in the Merced River. Would recommend to anyone that enjoys the feeling of privacy and being close to nature. 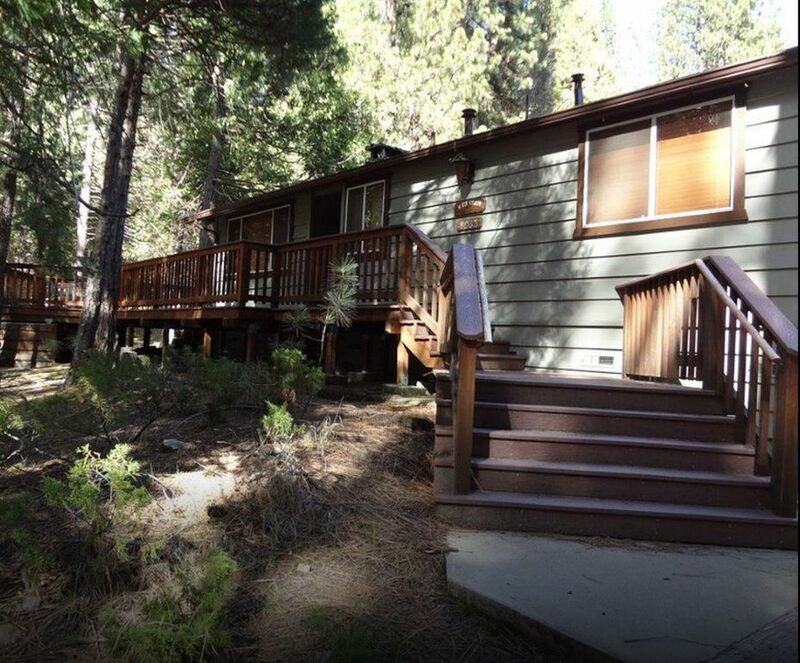 Comfortable and enjoyable house in a good location close to Glacier Point and the Valley. The king master bed and the queen bed are very comfortable. The sleeping alcove has a twin bed and a trundle. Both have rather saggy mattresses. So it depends on relationships how many people can stay comfortably. Everything was very clean, with two nice bathrooms and plenty of fluffy towels. Well equipped kitchen with enough glasses for a very (!) big party plus everything else needed. Comfortable living area with a great fireplace plus a huge deck with plenty of comfortable seating. The cabin is located within Yosemite National Park in the village of Wawona. Activities close by include hiking to Chilnualna Falls, swimming and fishing in the Merced River, golfing at the Wawona Golf Course, horseback riding, and relaxing at the historic Wawona Hotel. Easily accessible by car or bus are Badger Pass Ski Area, Glacier Point, Mariposa Grove of Giant Redwoods, and Yosemite Valley. The sights, sounds, and adventures offered by Yosemite National Park are incomparable.